​​The supervision cycle does not just end with observation and feedback. Linked to this process is the supervisor’s responsibility to organize professional learning opportunities for teachers. Although professional development is often viewed as schoolwide training, we advocate for multiple, differentiated forms of support for teacher learning. EMBEDDED & RELEVANT: Linked closely to the observation and feedback process, supervisors should plan and support teacher learning according to the specific instructional needs within a school. COLLABORATIVE: Teachers learn best when collaborating with peers. Teams of teachers might focus on one area (e.g. one science practice), learn about it together, and then observe one another to support the implementation of that change. LEVERAGE EXPERTISE: As supervisors design learning opportunities, they should consider ways to share expertise among teachers, as well as bring in external sources of expertise, either through print or digital resources or visiting experts. 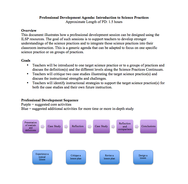 ​This ILSP tool illustrates how a professional development session can be designed using the ILSP resources. 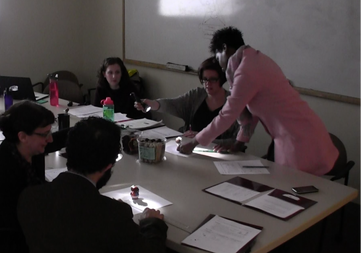 The goal of such sessions is to support teachers to develop stronger understandings of the science practices and to integrate those science practices into their classroom instruction. This is a generic agenda that can be adapted to focus on one specific science practice or on groups of practices. 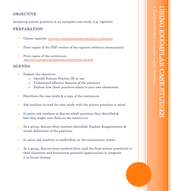 This ILSP tool provides step-by-step instruction to analyze the science practices embedded in exemplar case studies (e.g. vignette). The exemplar case studies show the effective integration of the science practices into science instruction. Using exemplar case studies can support instructional leaders' and teachers' learning around the science practice. This ILSP tool provides instruction on how to analyze the science practices embedded in video case studies. 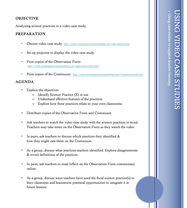 The video case studies provide real-life examples of classroom instruction to practice using the observation and feedback tools. ​Using video case studies can support instructional leaders' and teachers' learning around the science practice. ​This ILSP tool may be used to revise or design curriculum to better align to the science practices. It provides guidance for the use of the instructional strategies when revising or designing lessons and units around standards in order to better support student understanding and use of the science practice(s). 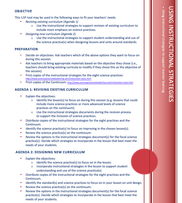 This ILSP tool provides instruction on how to use lesson adaptation activities. 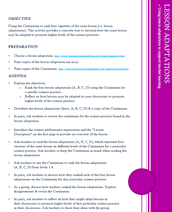 It provides a step by step procedure on how to use the Continuum to rank four vignettes of the same lesson (i.e. lesson adaptations). This activity provides a concrete way to envision how the same lesson may be adapted to promote higher levels of the science practices.